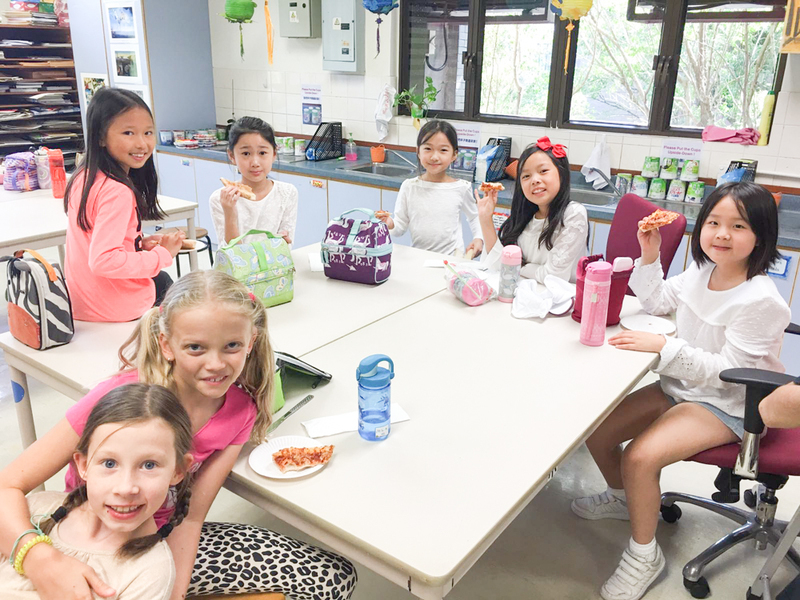 Last week, we had a Pizza Party for the Y4 students who worked so hard on their Fair Poster submissions. Y4 submitted the most posters out of any year. Well done Y4! Inspired by two years of a burgeoning service program at school, 12 Year 12 students are organising a free medical clinic in conjunction with the Stanley Wellness Center (http://www.stanleywellnesscentre.com/) and Dr Lauren Bramley & Partners (http://www.laurenbramley.com/). In collaboration with fourteen experienced medical professionals, the Free Clinic will provide a full range of medical services covering all manners of medical practitioners including general practitioners, nurses, osteopaths, obstetricians, counsellors, dentists, naturopaths, acupuncturists, and perineal rehabilitation therapists. We are currently raising funds to subsidise medicine for beneficiaries of the program, as well as to cover transportation costs. The Hope for Paws Foundation is one of the student charities that will be present at the Fair this year. Come and support them and find out more about their cause! Hope For Paws Foundation is a fundraising group that works to raise money for Hong Kong shelter dogs to give them a better quality of life. We also focus on raising awareness for these shelter dogs, and we strongly promote the idea of "adopt, don't shop", and we work on encouraging the public to adopt a dog rather than buying on at a pet store. We will be selling various items including notebooks from a primary design competition, and the net profit will go to smaller Hong Kong dog shelters such as Catherine's Puppies and Sai Kung Stray Friends, who is currently struggling with keeping the shelter running, especially after the big typhoon and rainstorm. Apart from raising money, we try to make regular trips over to the shelters to spend time being with the dogs that our money is going towards. These dogs do not get a lot of one on one time which damages their chances of getting adopted (because they don't really know how to be social), and going out there to spend time socialising them also raises their chances of adoption. Our ultimate goal is to help dogs get adopted, and to better their lives at the shelter while they wait. The student poster design competition has attracted a flurry of entries! Take a look at some of the wonderful posters that have been submitted so far. What creative students we have! Thank you for all your hard work guys! We would like to extend a special thanks to our art teachers! Thank you to Wendy Wilson who opened the Art Room over lunches for primary students to work on these amazing posters. Thank you to Georgina Martinago and the Secondary Art Team for spreading the word. Keep sending them in! Fair T-Shirts are on Sale NOW! You can order your fair T-shirts today! Please go here to order. For the first time ever we are having an exclusive pop up sale of our very best items from the Vintage Clothing Stall. Come along for a day of great shopping! We'll be starting to collect your second hand clothes from the 19th of October! Check this out for more details on what you can donate. Please drop off your items at the Carpark Guard House at school. This is the perfect time to sort out your wardrobe for the winter season (and the kids clothes too!). Need a helping hand? Check out this handy guide by A Pair and A Spare on the best way to go about doing it! Hi ladies! Thank you for volunteering! How long have you been involved with the Korean Food Stall? We both started to participate when kids joined CIS. It has been 3 years for me and 11 years for Sung Yon. Sung Yon didn't miss a year! The Korean food stall has to be one of the most popular attractions at the Fair. Why do you think people love it so much? We are just so blessed that Korean food became so popular in Hong Kong past few years. I always thought that kimchee is a tough food for foreigners to like but there are surprisingly high kimchee buyers at the fair. We are so thankful! What kind of items do you typically serve? As Korean community in CIS is not so big, we tried to keep the menu simple so would have less burden on volunteers. We have three set menus. Rice and kimchee with bulgogi (marinated beef), Japchae (noodles with vegitables) or both. We sell kimchee seperately too. In the canteen on the 6th Floor. Walk up or take the lift to get there. You can't miss us! Tell us a bit about the team of Korean mums that volunteer. I am super lucky to work with enthusiastic mums who have more experience than I have. They are the experts working in the Korean Food Stall for many years so I just need to gather them and listen to their suggestions. What is your favourite part of the Fair? My favourite part of the fair is to get to know many parents and teachers in a deeper level and to get to serve the CIS community together in some way. Tasty baked goods are always my first and last stop and of course my sons enjoy games and prizes. Poster Competition - Submissions Are Coming In! Get your submissions for the poster competition in! Check out this awesome poster created by Eunice Li Jun Lai. Wonderful work Eunice - we love it! Get involved in the CIS Fair! We are looking for talented students to design a poster for the fair. Both Primary and Secondary students are encourage to submit designs. Winning designs will be made into posters to be displayed at school and featured right here on the website. The posters need to feature information about the fair and to highlight this year's fair theme both in English and in Chinese. 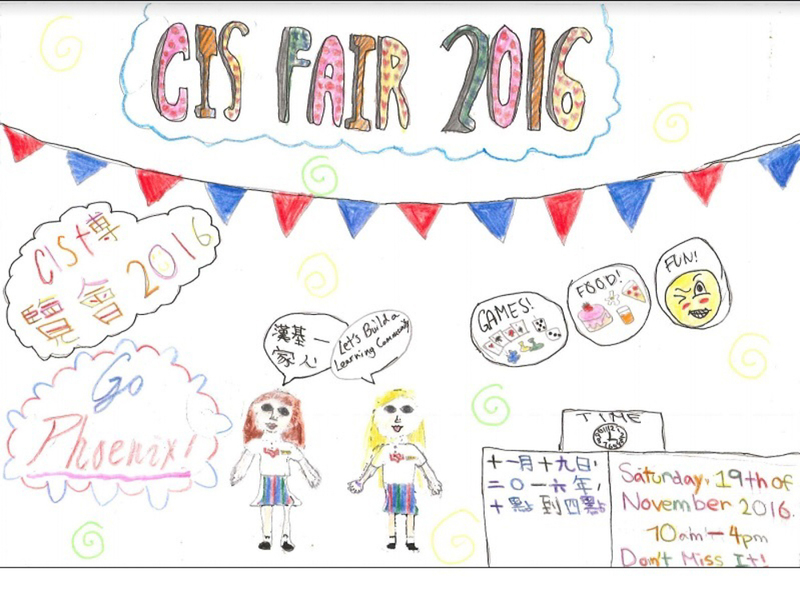 The theme of the fair is CIS United: Building Community. It's a celebration of the CIS school spirit and warm CIS community. Submission: Please hand in your designs to your art teachers at school anytime before October 21, 2016. The Vintage Clothing stall is an Aladdin's Cave of treasures. Its a hugely popular part of the Fair and people in the know come early to get the best items and the best bargains! Here we speak with Zoe Lau and Yana Chung Tsang '95 who are running the Vintage Clothing stall this year. Hi ladies! Thank you for volunteering. Can you tell us a little about yourselves and how you came to be involved with the Vintage Clothing stall? The two of us met more than 15 years ago when we worked for the same financial services company. We loved working together professionally and became dear friends over time. When we both became CIS parents, we wanted to work hand-in-hand to serve the CIS community. Joining the CIS Fair committee gave us the perfect opportunity to enjoy the best of both worlds. We couldn't think of a better way to have fun and make a difference at the same time! Last year, we took on the challenge of running the Bake Sale, despite not knowing the first thing about baking. Thanks to the tremendous support of our generous sponsors and talented community, we stocked our stall with endless goodies (you don't want to know how much we sold in calories!). You could smell the sweet aroma of our stall from miles away! This year, we decided to pass the rolling pin (i.e. baton) to Carrie Seto '00 and Lisa Chan '00, who know much more about baking than we do. Given how much fun we had on the Fair Committee last year, we immediately raised our hands to cochair a different "business". That's how we ended up trading in our flour-dusted aprons for a more "glamorous" look selling lovingly-used vintage items. Gosh, what don't we sell? Thanks to the generosity of our community, we will be selling all sorts of clean, good quality clothes, bags, shoes and accessories. Loyal customers will know that when it comes to our stall, early birds get the worm. So make sure Vintage Clothing is your first stop! You want to beat the crowd to get the first pick of the best items. And bring BIG shopping bags - you will find lots of gems as you go through our racks! We will also be selling environmentally friendly shopping bags at the Fair this year, so you can buy these from us to carry your shopping if you forget to bring your own! We'll be in the carpark right next to the Bake Sale. Follow the aroma of sweet treats and savory goodies and you won't miss us! Any tips to find the very best items and bargains? Shhhhhh! Don't tell anyone we said this, but volunteers who help us set up the day before the Fair will get a special "preview". We may even let you reserve a couple of items. Wink wink. What do you need volunteers to do and where can they sign up to help? We need you. We need your friends. We need your family members. We need lots and lots of people to help sort through donations and set up the day before the Fair. Please click here to sign up now! We're not biased or anything - of course we're not. Vintage Clothing is simply the best! Don't miss out! Oh, and I, Yana, love Spin the Barrel too because that's the stall that my dad created and ran for more than a decade when my sisters and I were students at CIS. Kids just love the Spin the Barrel game, where you are guaranteed to win a prize! We speak with Mimi Goh who has been organising the Spin the Barrel game for a couple of years. Hi Mimi! Thank you for volunteering again. Tell us about Spin the Barrel - how does it work? It is a fun game!! You are guaranteed a prize and you can choose the prize yourself. One fair coupon for a spin, you pick up the color ball from the barrel, then you choose the prize base on the color ball you picked. We always have new prizes stock up from time to time so its fun to come back to have more spins. From toddlers to grownups!! Everyone just loves Spin the Barrel!! We will most likely be in the car park. How did you come to volunteer? I'd like to volunteer too, what can I help out with? Of course Spin the Barrel!! That I am able to meet new friends and see familiar faces. I also like the bake sale also, they are awesome!! The Book Sale is a treasure trove of reading material with something for everyone, kids and adults! Come browse and find something you'll love! We speak today with Wen Zhang and Marina Chira who have been long time organisers of the book sale. Hi ladies! Thank you for volunteering again. How long have you been involved with the book sale and how did you come to volunteer with the stall? Both of us have been involved in the school Fair for many years since our children joined the school. We both started with the Flea Market and then moved on to the second hand books. What do people love most about the book sale? People who visited the book sale are themselves book lovers or have children loving reading, or both. Thanks to generous donations and love-to-read culture of the CIS school community, we have a wide range of donations of books, CDs, and DVDs in English and Chinese, occasionally in other languages too. One can almost always find something interesting, whether it is pre-school baby/toddler readings, classic children's literature, biographies, sci-fi, latest teen readings, SAT and exam preparations, best-selling adults' fiction or non-fiction, personal development, health and travel, cooking books, art and design etc. In addition, our books cost next to nothing. We charge $10 each for paperback, and $20 each for hardback. We also offer discount to bulk purchases. Year on year, we have many parents and teachers buying books from the book sales and donating the books bought from us in previous year. It is such a fun way to read and recycle. We will most likely be in the car park, right next to the cafe area. I want to buy a lot of books! How do I carry it all? If you purchase over $200 value of books from us, we are happy to keep them for you till the end of the Fair. What happens to any books left unsold at the end of the Fair? All the unsold books will be given away to charitable organisations. For many years, our senior secondary students run the Philippines Book Project. After the Fair, they will help to collect and send unsold English children books to the Philippines. For Chinese books and remaining English books, we will donate them to Hong Kong-based charities. Tell us a bit about the team. What do you need volunteers for and how can they sign up? At moment, Marina Chira (Y1 and Y5 parent) and Wen Zhang (Y8 parent) are parent volunteers in charge of the second hand books. If any parents are interested in joining the team please sign up here. Starting from November 1, the team will begin the sorting of donated books into different categories. Large number of parent volunteers are wanted. Everyone is welcome. To help, many parents take advantage of the time after they drop off their child(ren) to school in the morning or before pick up the kid(s) in the afternoon, whether it is for one or two hours. Being involved in the Fair is fun and rewarding. It is one of the best ways to get to know other parents, the school and the community. Through such involvements, we have got better appreciation what makes the school unique and great, which in turn allows us to talk more sensibly with our children about their school life and offer more effective supports. All the money from the book sales goes to school to benefit our children. The Taiwanese food stall started last year and was so popular that it's back for the second year running. Bubble tea anyone? Here we speak with the Taiwanese food stall team organisers, Eva Chang, Tiffany Yang and Pei Yin Chen. Hi ladies! Thank you for volunteering! Tell us a bit about the Taiwanese food stall! This is our second year of Taiwanese food stall, we had so much fun and good feedback from last year so that we are definitely looking forward to seeing more people loving our food this year. You were very popular last year and I believe sold out before the Fair ended! What kind of items do you typically serve? The typical Taiwanese food we are preparing is braised pork rice and passionfruit bubble tea (the same as last year). Taiwanese sausages will be our new twist this year. Tell us a bit about the team of moms that volunteer. Our favourite part of the Fair is, we are able to participate as a host at our food stall to welcome our guests, but also enjoy being there playing games and trying out new things while we are not on duty. The Sausage Sizzle is a real crowd-pleaser and one of the biggest food attractions at the CIS Fair. People usually find it by just following the mouth-watering smell right to the stall! It's a great one too for CIS Dads to volunteer at. Here we speak to Brad Okita and Bill Porter who have been long-time organisers of this firm favourite of the Fair. Hi guys! Thank you for volunteering again. How long have you been involved with the Sausage Sizzle? I think I've been involved for four years, and Bill was involved at least a year before me. The Sausage Sizzle has to be one of the most popular attractions at the Fair. What do you typically serve? We start the morning with what's known as a "Bacon Buttie", which is bacon served on a fresh bun with a butter and some HP sauce. A classic, which helps everyone who is at the Fair early get started. Next we usually have a selection of sausages, starting from traditional hot dogs, English bangers, as well as really lovely Swiss veal sausages. The quality is really nice, and cooked lovingly by CIS parents, teachers and staff. We will most likely be at Moongate, right in the middle of the Fair. Just follow your nose! Tell us a bit about the team. Who usually volunteers and what do they do? Lots of Dad's who probably don't get to BBQ enough on the weekends. We have good music in the background and it's a nice place to hang out. Apart from the Sizzle, the baked goods are always tasty. The games in the Lower Primary Gym are always fun, too. Please note that beer is sold at the sausage sizzle and sales are strictly prohibited to persons under the age of 18. The Bake Sale is a hugely popular part of the Fair and amazingly sells out every year. We couldn't do it without the help of the amazing CIS community and the wonderful bakers: mums, dads and kids! Here we speak to Carrie Seto and Lisa Ma who are heading up the Bake Sale this year. Hi ladies! Thank you for volunteering! Tell us a bit about yourselves and why you volunteered for the Bake Sale! Lisa and Carrie has been friends since 1996 (we’re both CIS alumni from class of ’00!) From college to starting a career and our own families, we’ve both been there to support one another through the good times and the bad. This is what makes CIS a great community – the friends you make here are for life! Carrie was involved in the Bake Sale last year and was asked to participate in the Bake Sale this year again. Lisa’s older son, Lucas, has just joined reception this year and being a new CIS parent, is eager to be involved in the CIS community, so we immediately joined forces to volunteer for the Bake Sale. It’s a big responsibility as it is such a big part of the Fair, but hey, who doesn’t like to be surrounded by baked goods and sweets all day? The Bake Sale has to be one of the highlights of the Fair. What kind of items do you have at the stall and which are the most popular? We have everything from cakes, cupcakes, cookies, pies, brownie, muffins… And it’s not all about sweets, there are savory items too! The CIS community is certainly a talented bunch! Everything is popular as we always sell out but the brownies, chocolate chip cookies, cupcakes seem to be particular favourites. Over the recent years more and more people have been looking for healthier choices such as granola, or alternative diets such as vegan and gluten free items. We have a section dedicated to these specialist diets too! There are donations from professional bakeries too? Yes there are! Make sure you come early because the goods sell fast! In previous years we have had donations from Tai Tai Pie Pies, Sift and more! Our stall is located at the entrance of the parking lot, so come grab a mid-morning snack when you arrive, or stock up on baked goods just before you leave (if there’s anything left!!). If you buy a large amount of items you can even leave it with us for pickup later. Our stall will also include the lemonade stand, and situated next to a small café area where you can grab a cup of coffee of tea to enjoy with your baked goods. How can people volunteer to contribute or sell items on the day? If you are interested to donate or help out with the bake sale, please take a look here. And don’t forget, we welcome all parents, teachers, students and alumni to help and support! Even if you’re not much of a baker, come sign up and help to sell! Our favourite part of the Fair is definitely being able to spend time at the school with our friends and families, see familiar faces from teachers to old classmates to meeting new friends, young and old. There’s always something for everyone at the Fair and the atmosphere is wonderful. The CIS community is really like one big family. Want to know what the CIS Fair is like? Relive last year's Fair by watching this great video put together by the talented students of CIS Commercial Production Group. The theme for our fair this year is CIS United: Building Community. It was chosen to reflect our strong school spirit and the sense of community and camaraderie that the fair day brings. 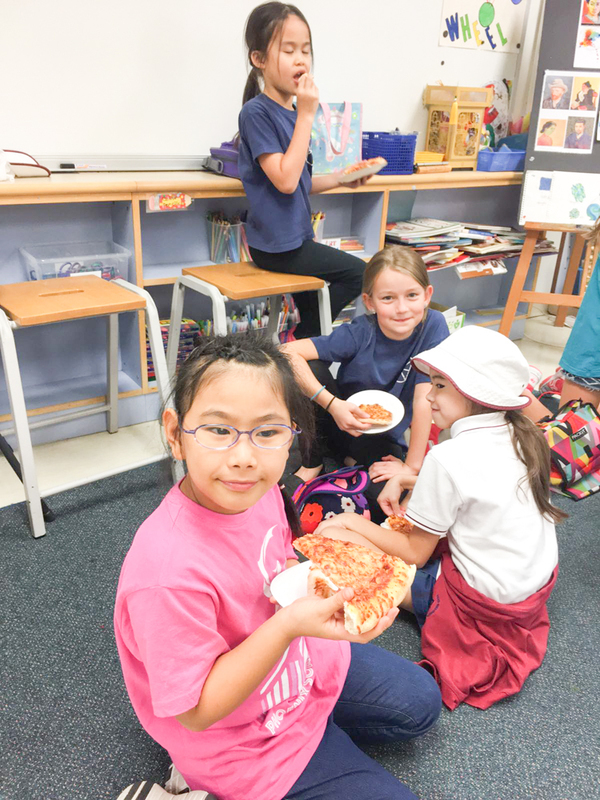 The school fair is such a wonderful opportunity for the school to get together, meet up with friends, teachers and parents, and simply have fun! Take a look at the wonderful logo for the fair this year designed by Michelle Tung, our super talented committee member in charge of graphics. It's the beginning of a new school year and the CIS Fair Committee 2016 has already been hard at work preparing for the upcoming fair later this year. Following on from the resounding success of last year's fair, we're working hard to make the event this year even better than before! With fun games, great food, charity stalls and a diverse range of shopping, it's definitely a day to look forward to! We've gathered a great team of people to help organise this year's fair but we're always looking for more volunteers! Whether you want to be part of the committee, contribute to one of the stalls or just donate items, take a look at how you can help. Keep reading our blog for more updates throughout the year on how the fair prep is going, interviews with CIS supported charities, showcasing our local vendors and much more!